Drivers today are faced with many concerns over safely using a smart phone in the car. State laws, lease agreements and simple operational designs contribute to the decision making process. The JBL TRIP is designed with all of these factors in mind. HARMAN’s exclusive Voice Cancellation technology allows for crystal clear phone calls even with road and wind noise in traffic. Navigation and ADAS apps like iONRaod wirelessly, send safety and turn prompts via Bluetooth; simultaneously, the driver can easily listen to their factory radio for local newscasts or traffic updates. Because the conversation doesn’t stop when you park, the TRIP is also designed to be portable. It quickly attaches to the visor in a rental car or can be taken into the hotel room, kitchen or office to continue working. 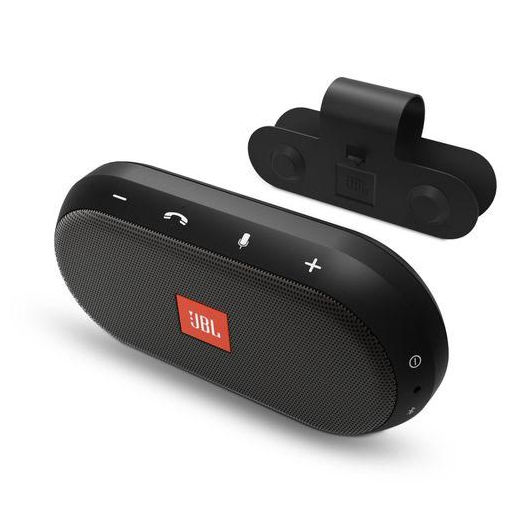 Built with JBL’s sound heritage, it’s just as comfortable as a Bluetooth speaker and can keep the music playing for up to 8 hours before a charge. I tested the JBL Trip with the windows down and the sound was still crystal clear and the Bluetooth picked up my voice clearly. The JBL Trip works like it says, I was quite impressed!